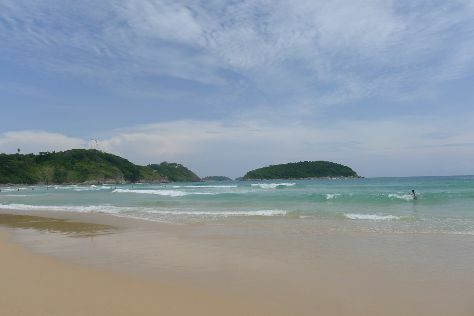 On the 19th (Sun), take in the spiritual surroundings of Wat Chalong, enjoy the sand and surf at Rawai Beach, then get great views at Nai Harn Beach, and finally get great views at Karon View Point. For traveler tips, photos, and tourist information, use the Rawai vacation planner . Chicago, USA to Rawai is an approximately 23.5-hour combination of flight, bus, and taxi. You can also do a combination of train, flight, bus, and taxi. The time zone difference when traveling from Chicago to Rawai is 13 hours. 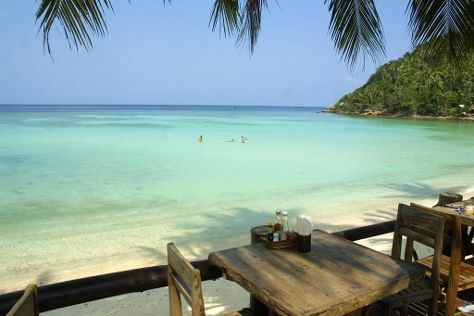 Traveling from Chicago in May, you will find days in Rawai are somewhat warmer (90°F), and nights are warmer (75°F). Finish your sightseeing early on the 19th (Sun) to allow enough time to travel to Ko Phi Phi Don. On the 20th (Mon), Head underground at Viking Cave, Head underground at Ko Phi Phi Le, then make a trip to Koh Phi Phi Viewpoint, and finally head off the coast to Bamboo Island. To find ratings, reviews, and more tourist information, read Ko Phi Phi Don trip planner. Do a combination of taxi and ferry from Rawai to Ko Phi Phi Don in 1.5 hours. Expect a daytime high around 91°F in May, and nighttime lows around 76°F. Finish your sightseeing early on the 20th (Mon) so you can ride a ferry to Ko Lanta. Kick off your visit on the 21st (Tue): get outside with Outdoor Activities. Keep things going the next day: experience rural life at Shaan and Jeevan's Eco-Farm, kick back and relax at Long Beach, then look for all kinds of wild species at Lanta Animal Welfare, and finally get to know the fascinating history of Lanta Old Town. Find out how to plan Ko Lanta trip without stress by asking Inspirock to help create an itinerary. You can ride a ferry from Ko Phi Phi Don to Ko Lanta in an hour. In May, daytime highs in Ko Lanta are 92°F, while nighttime lows are 75°F. 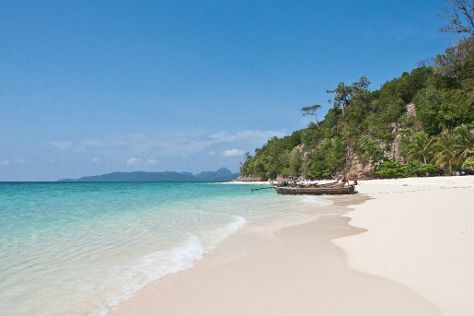 Wrap up your sightseeing on the 22nd (Wed) early enough to travel to Ko Pha Ngan. On the 23rd (Thu), see some colorful creatures with a scuba or snorkeling tour. On the next day, enjoy the sand and surf at Salad Beach, then let little ones run wild at Phangan Jorkyball, and then tour the pleasant surroundings at Thong Nai Pan Noi. To find photos, maps, where to stay, and tourist information, you can read our Ko Pha Ngan online route builder . Traveling by combination of ferry, car, flight, and bus from Ko Lanta to Ko Pha Ngan takes 7 hours. Alternatively, you can do a combination of bus and flight; or do a combination of bus and taxi. Plan for somewhat warmer nights when traveling from Ko Lanta in May since evenings lows in Ko Pha Ngan dip to 82°F. Wrap up your sightseeing on the 24th (Fri) to allow time to travel to Bophut. On the 25th (Sat), take a tour by water with Boat Tours & Water Sports. Here are some ideas for day two: kick back and relax at Maenam Beach, kick back and relax at Lamai Beach, then enjoy the sand and surf at Chaweng Beach, and finally have fun at Lazgam Laser Games Koh Samui. To find traveler tips, maps, ratings, and more tourist information, read Bophut trip planner. You can do a combination of bus and taxi from Ko Pha Ngan to Bophut in an hour. Another option is to take a bus. 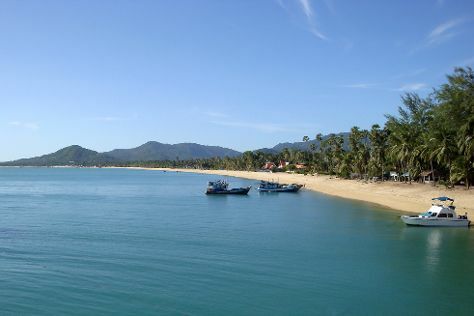 In May in Bophut, expect temperatures between 92°F during the day and 82°F at night. Wrap up your sightseeing by early afternoon on the 27th (Mon) to allow time for travel back home.